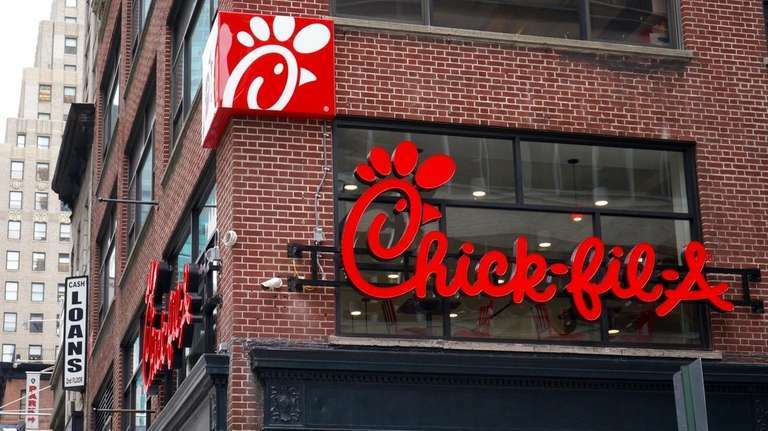 The opening of New York City's first full-service Chick-fil-A outlet Saturday brought out several hundred connoisseurs of chicken sandwiches who stood on long lines in the rain and protesters who accused the fast-food company of being anti-gay and promoting animal cruelty. Restaurant representatives outside the store at 37th Street and Sixth Avenue in Manhattan tallied almost 7,000 customers being served in the first eight hours. Chick-fil-A previously opened a service counter in an New York University food court. Demonstrators who represent the LGBT community also entered the store, pulled out placard pictures of chickens and pigs and chanted "Take Your Store and Go Away" before they were removed by police. The animal references were about factory-farming methods. There was also a handful of religious counter-demonstrators who mocked gay and lesbian protesters. Several chanted "repent." One gay protester kissed her girlfriend in defiance. Teddy Bugniazet, 23, of Rye, ignored the protesters. "This is America. You can do what you want. I love chicken and there is nothing wrong with supporting family values," he said. Carrie Kurlander, vice president for Chick-fil-A Inc., public relations, said in a statement that the franchise uses "antibiotic-free" chickens that are raised with "the highest guidelines and animal welfare standards." On relations with the gay community, the statement read: "Chick-fil-A, Inc. is an equal opportunity employer." Michael Cronin, 35, of Astoria, Queens, said he came back to the fast food restaurant after years of boycotting it after an uproar in 2012 because the S. Truett Cathy family that founded the chain had donated to groups that opposed LGBT rights causes. "I lived all over the Midwest and ate at these restaurants. But I stayed away and pledged not to come back," said Cronin. Last year, Chick-fil-A CEO Dan Cathy said company's leaders would pull back from their traditional-marriage activism because "the wiser thing for us to do is to stay focused on customer service." Cronin said, "I'll take him for his word." The Atlanta-based company has been selling its chicken sandwiches and lemonade drinks in the South since the 1960s. The company opened its first New York store in Manhattan and will open its second in Port Jefferson on Oct. 3. Many customers waiting on line were out-of-state college students who wanted a taste of home while New Yorkers came to recollect memories of having eaten the sandwiches when visiting families in the South. "I always remembered this place -- their waffle French fries and lemonade,' said Samara Luke, 20, of Brooklyn.